Elijah was a man known for his tenacity in prayer – maybe even some chutzpah. The pale green orb-weaving spider dangled from the ancient juniper in my front yard. The sun had kissed us goodnight; the moon now lit the earth with a soft glow. The spider was nearing completion of his massive web that stretched from two juniper branches to the shed ten or twelve feet away. Clearly, I kept my distance, but watching his tenacity inspired me. I had struck this web down the past two evenings, only to find it reconstructed late at night when I took Blue out a final time before bed. The giant web twinkled like stardust in the moonlight, its host resting in the center waiting for an unsuspecting insect. I have learned that by morning this spider will consume its web completely, hide in the tree or a corner of the shed, and then rebuild the same intricate masterpiece again at nightfall. Elijah was a man known for his tenacity, especially in matters of faith and prayer. There is even evidence of a little chutzpah. Donning his prophet mantle, Elijah traveled the land of Canaan from the Brook Cherith to Zarephath where he performed the miracle that sustained the widow and her son. From there the Lord sent him to confront Ahab in the area of Samaria where a drought and severe famine had consumed the land. This was the drought Elijah had prayed for. Elijah had prayed earnestly that it would not rain so the people who were worshiping Baal would know that it was the Lord their God who controlled the rain, not Baal. For three years and six months there had been no rain. Now the Lord was ready to get the attention of His people, and especially King Ahab and Jezebel. God sent His man of faith to challenge the prophets of Baal to a contest — a showdown — to prove His superiority over Baal. Elijah defeated 450 prophets of Baal who, after six hours of wailing and cutting themselves could not get Baal to accept their burnt sacrifice. Elijah, on the other hand had the ear of his Lord. That showdown took tenacity — a steadfastness in Elijah’s faith. And then we see his humility. But there wasn’t. Not yet. 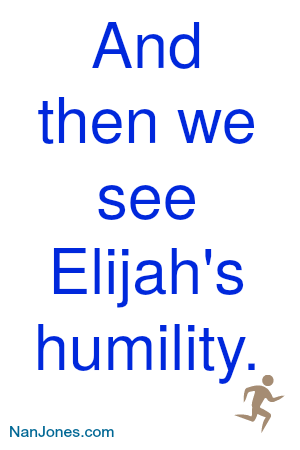 Elijah had tenacity, chutzpah, and humility. Elijah stood on God’s promise. He was so much like us. 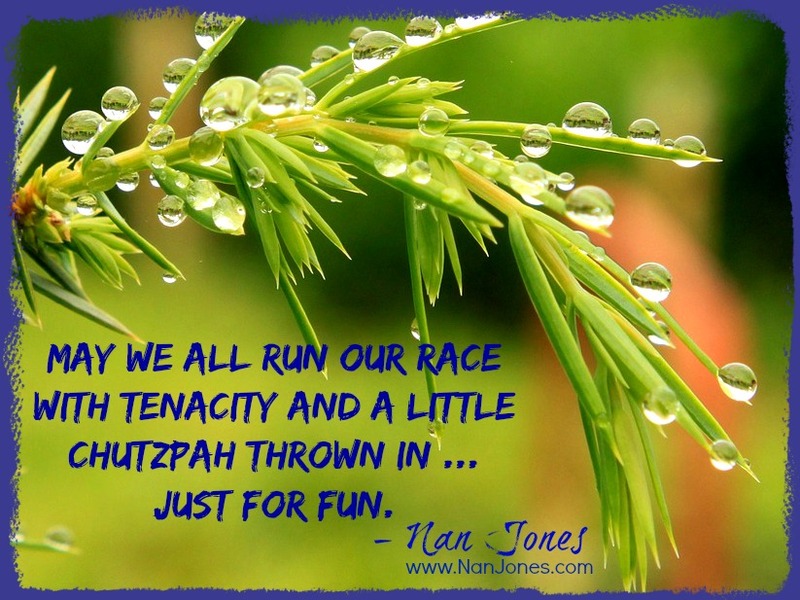 May we all run our race with such tenacity and a little chutzpah thrown in … just for fun. 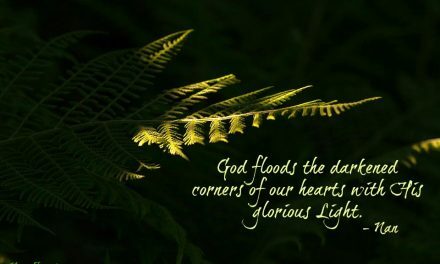 PreviousWhere is God When My Light is Dim? NextWhere is God When I Need His Grace? Elijah has always been my favorite person in the Bible because I’ve always been able to relate to him. I love this. I want to learn to pray like Elijah. Me, too Marcie. I also love how authentic Elijah was in his faith – much like David throughout the Psalms. They trusted the Lord enough to tell Him exactly how they felt. How awesome is that? I certainly need more chutzpah in my life! Right now, I’m facing a decision between a low-paying but stable job and a much better opportunity on a freelance basis. I believe the Lord is leading me to take a chance, for many reasons, one of which is that the better-paying job is for translating and editing Christian material. But I don’t want to presume to know what God wants to do. I still need to pray for wisdom and God’s guiding hand. I also believe I need more tenacity to battle for God’s promises for my life. 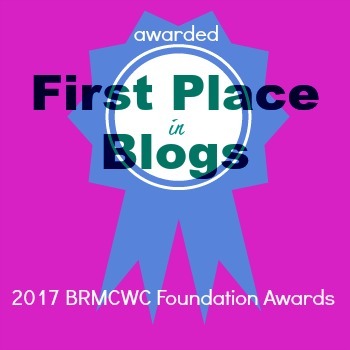 Right now, my writing dream is like a cloudless sky after three years and a half of no rain at all. Yesterday I was given the image of Ezekiel prophesying to dead bones. This is another powerful image. I need to prophesy to the sky, and pray believing that even though I cannot see the clouds just yet, rain will surely come and will bless not only me, but many others. Thanks for yet another encouraging message for my weary and fearful soul. You’re so welcome. Something I’m learning to do is to be still. Cease striving. And remember that He is God. I try to remember to seek the Giver and not the gift also. When I do these things, I find peace. 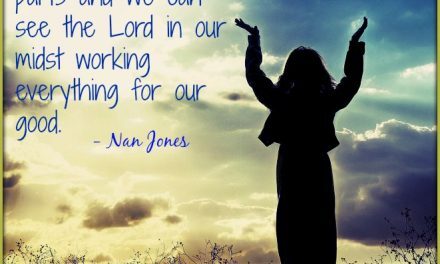 Nan, It’s amazing how the Lord uses you to speak to me and confirm what He’s been telling me. This “cease striving” has been my constant thought since I read it. 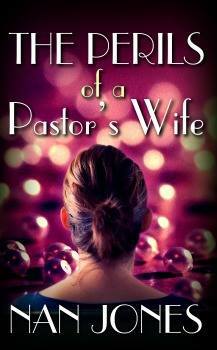 God has given me many passages about this very topic. He has reminded me in Exodus 14, 2 Chronicles 20, Psalms 46 and Psalms 20 and Isaiah 43:16-19 that indeed this is not MY war, but HIS. It’s not me fighting and God somehow helping. 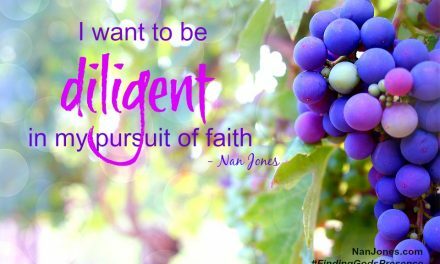 It’s God fighting for me and, sometimes, through my little seeds of faith. How encouraging, Nan! I love the story of Elijah, but I also love the way you compared it to the orb weavers. They drive me crazy because they decide to build their webs on our back patio or in front of a garage door–they are tenacious! This made a very clear picture in my mind. I will remember the tenacity to battle for God’s promises when I get discouraged, and especially when I see an orb weaver! You are a blessing! You are a blessing to me too! And yes, those boogers ARE tenacious and SO big! 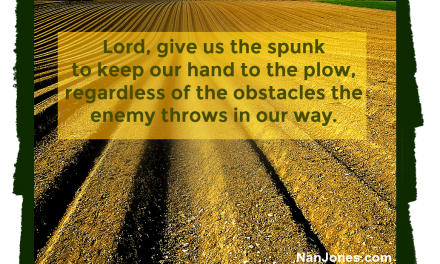 God never wants us to give up – surrender, yes – but give up, no. Beautiful, daughter! I am so proud of your work for the Lord that I could just burst. Hugs, hugs, HUGS! Judith!! You just made my heart smile. Thank you. I think of you often and love you dearly.